Happy New Year! OISHI Vol. 12 continually introduces the fascinating stories about Japanese foods and culture. This issue focuses on the appeal of Oigawa railway in Shizuoka prefecture – you will have a very fun time enjoying the wonderful local foods and drinks. Bean There, Done That – Three common types of beans used in Japanese sweets and desserts. 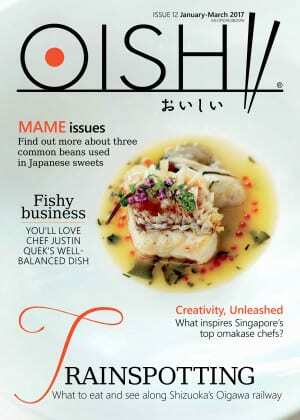 Fishy Business – The chef explains the similarities between Japanese and French cuisines. Chasen The Dream – Introducing the essential tool for the art of the Japanese tea ceremony. Playing With Food – This creative team in Japan allows you to create your own cocktails using voice – recognition software!